We received a message from Yovany Munguía just after supper time this evening. I have pasted it below. "Thanks a lot to Jehovah God that love so much to Honduras (and type of earthquake on the sea, horizontally and no vertically movement of the plaques), we don't have big troubles, destruction or thousands of Hondurans dead. Thank you to you for your permanent praises for Honduras. In the Mataderos tribe there are some destroyed houses and others that are damaged, but all the people that you know are fine. 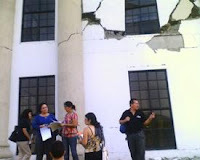 The school building survived the ¨temblor¨ without problems. There may be problems of communication in the next days, for the movement of the submarine cables that transmit Internet and long distance calls, but in the next week, all will be good (in this aspect)." I also am reprinting parts of an article (translated from the Spanish) that was on the La Prensa web-site this afternoon. Seven people are reported dead after the earthquake of 7.1 degrees on the Richter scale at 2.24 in the morning of Thursday, I caught the vision to Hondurans and filled with fear. The authorities of the Standing Committee on Contingencies, Copec, was demolished about 80 houses, three affected bridges and a hospital, 16 schools, eight public buildings, two hotels, seven churches, factories and nine damaged. 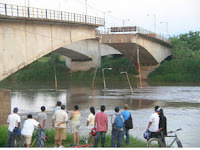 The greatest damage to the road network in the country, authorities reported on Public Works, was the rupture of the old bridge La Democracia, El Progreso, Yoro, was impassable and therefore must be reconstructed. A newly paved stretch of highway CA-5, which links San Pedro Sula and Tegucigalpa, was cracked in Santa Cruz de Yojoa. The road network also suffered breaks in Omoa and Puerto Cortés. Property of the courthouse was damaged. Although the tremor was felt with more intensity in the Bay Islands and La Ceiba in these areas are not reported significant damage. 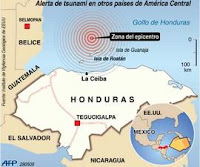 The earthquake occurred at latitude 16.78 north and 16.16 degrees east longitude, the epicenter was 10 km deep and was caused by movement between the Caribbean plate and the North American plate, as the director of the department of Geophysics of the Universidad Nacional Autónoma de Honduras, Gonzalo Cruz. The strong shaking which lasted about 30 seconds, was felt throughout the country and caused panic among the people who took to the streets in many areas but the power was interrupted. There was a powerful 7.1 magnitude earthquake at 2:24 a.m. Thursday morning (May 28) killing at least six people and wounding 40 more. These figures may change. Southeast of San Pedro Sula, half of the 120-meter (130-yard) Democracy bridge in the town of El Progreso collapsed. This is a bridge over the Ulúa River, the most important river economically. Maritza Varela, director of the El Progreso Hospital reported that at least 13 injured people were admitted early this morning, one an adult with a hip injury and two minors, one of five years and the other nine were sent to the Mario Catarino Rivas hospital due to severe multiple skull injuries. They are sisters and live in Cologne La Nacional. Patients from the second floor were taken to area hospital's garage for several hours. The wall of the court house in San Pedro Sula was damaged. This is in the area of Santa Barbara, Honduras. All pictures were from La Prensa on-line. more will be posted here. The next NY/HELP mission trip to Honduras will be the first two weeks of August! Joining Dr Gordon Comstock will be Nancy Savoy of Buffalo, a women’s health nurse practitioner, and Eileen Brittain of Arcade, who will be our Spanish linguist. We will be having a medical clinic and hopefully survey new water systems. The last room of the new middle school in near-by Mataderos should be completed by the time we arrive. NY/HELP has been working with people from the local communities to build this school, so that children from this mountainous area could continue their education past 6th grade, without having to go to the “county seat” of Yoro, some 20 miles (and 4 hours travel) away. This has been a big thing for the tribal communities here! 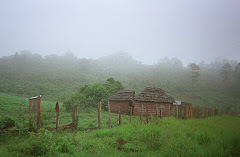 NY/HELP is still in need of donations to help equip the library at the school, as well as donations to provide medicines for the clinic and water projects and health improvements in the ten communities that make up this mountainous neighborhood. There is still time to join the trip, which leaves August 2. If you are interested, or want more information, contact Gordon or Ginger Comstock at gkcomstock@gmail.com.